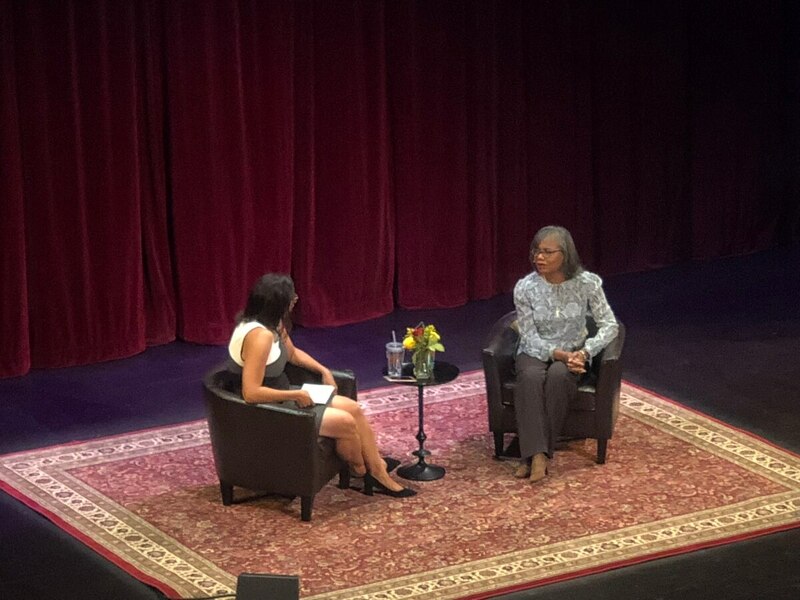 The woman who became an icon spoke at USC on Thursday. Anita Hill told college students they should speak up about sexual harassment. At a forum in Bovard Auditorium on campus Thursday, the attorney and professor said her experience during the 1991 confirmation hearings for Supreme Court Justice Clarence Thomas is similar to what Christine Blasey Ford experienced this fall. Hill went into detail about her experience with Thomas, who was confirmed despite her accusations of harassment more than two decades ago. She said she viewed it as "my job to tell what happened to me," and encouraged young women experiencing harassment to be brave and tell their stories. She said, "We need to learn more from these people who are coming out and speaking out." Even if nothing changes, talking about the issue will help others, Hill said in a wide-ranging discussion with USC Professor Ange-Marie Hancock Alfaro. Hill, who has been one of the icons of the #MeToo movement, said men have power and privilege. She also talked about Brett Kavanaugh, who was confirmed to be a Supreme Court justice after a high-profile hearing when Ford said he had assaulted her when they were teenagers. Hill called Kavanaugh "inauthentic," and said his behavior during the testimony "was a performance." She also criticized the handling of the Senate confirmation process. Current USC law school student Ryan Easan stood in a long line before the event began and said Hill's appearance showcases that sexual harassment is a big issue in the contemporary dynamic. He said he wanted to hear Hill's opinion. "She has a significant role to play in really informing people being aware of this issue," he said. Austin Maddox, an Annenberg student, called Hill "a model for how women are treated in politics, especially women regarding sexual harassment." Both Easan and Maddox praised the MeToo movement. "It encourages more women to come forward," Maddox said. Easan said the movement "shows how far we need to go for achieving the goal." Hill said it is unfortunate that sometimes race and racial stereotypes can influence how accusers are viewed. "Race is always the factor on the issue of sexual harassment," she said. During the Q&A portion of the event, Hill was asked about the role of journalists in the movement and she said the media is very important to the process, now more than ever given all the tools available to tell stories. Another student asked Hill what she would ask Kavanaugh if given the opportunity. Her response was, "how do you view yourself?"